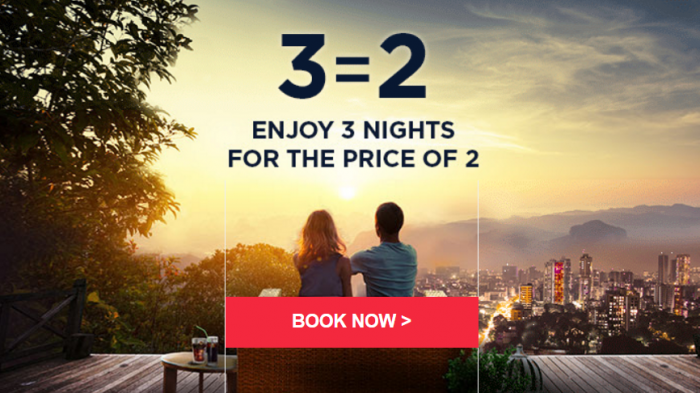 Le Club AccorHotels has launched new worldwide 2 = 3 sale for stays between March 18 – May 28. 2017, that must be booked by March 28. The offer that is basically third night free is valid at participating properties when booked by March 28. Note that this sale is valid for stays of three nights only. It is worth checking the prices under this offer. Sometimes they may work for you while other times they don’t. You should only book this rate if your plans are firm as it is prepaid, nonrefundable and noncancelable. – and applicable to all stays between 18th March and 28th May 2017 included, at participating hotels. – Hotels in Germany and Austria : stays from 18th March to 1st May 2017. – Hotels in Middle East : stays from 18th March to 22nd June 2017. – Hotels in United Kingdom : stays from 18th March to 4th June 2017. Offer valid on three-night stays only. The free night is calculated by applying a 33.33% reduction per night – based on the NORMAL unrestricted RATE for the dates requested upon booking – for stays of exactly three nights. Non-binding exchange rate given for information purposes only. The rate will be confirmed at the time of booking (if payment is made in a currency not used by the hotel, fees may apply). Offer valid in AccorHotels Group’s hotels and independent participating hotels subject to availability of allocated rooms. Fairmont, Raffles and Swissôtel hotels are not part of Le Club AccorHotels loyalty programme. The clients booking a stay in one of these hotels won’t earn Le Club AccorHotels points. Accor Plus members do not get any aditional discount when booking a stay in a Fairmont, Raffles or Swissôtel hotel.